Kohutu Health provides complementary health care for a wide range of conditions. SCENAR is an approved medical pain relief device. Issues of nutrition and thyroid/adrenal function are critical in helping many chronic conditions. These include heavy metal and chemical toxicity as well as the gut-brain connection in ADHD, depression and related disorders. We are located in Manakau, three minutes off SH1 between Otaki and Levin. Kohutu Health arose after the death of Pip’s mother, radiographer Marj Gordon following her exposure to the toxic chemicals used in processing xrays. Her daughter, Phillippa (Pip) Martin, became interested in the effects of chemicals used in workplaces, and began searching for answers to help with toxic chemical and heavy metal loads in the body. In 1997 she established SNFTAAS – The Support Network for the Aldehyde and Solvent Affected, an organisation which provides information to affected people to support their healing, as well as raising public awareness with government action to prevent toxic exposure. For this work she received a QSM. Here Nathan Howell receives LASER on reattached fingers after a concrete-cutting accident requiring 12 hours of surgery. Nathan received SCENAR treatment to speed healing and his surgeon stated that he had never seen such a fast reattachment. 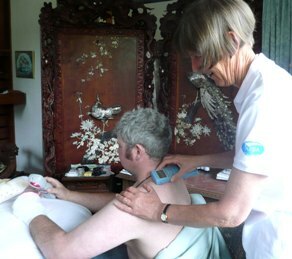 Pip has travelled extensively to learn about medical therapies and new techniques. She has been especially interested in finding safe, non-invasive solutions as many people with environmental sensitivities / toxic loads react badly to petrochemical-based drugs. Therapies and strategies which have been helpful in the clinic for people with a wide range of ailments are Scenar, Soft Laser Light Q-1000, the Healing Blanket, looking at thyroid/adrenal function, Homeobotanicals, heavy metal chelation, Body Talk, Sunlight Far Infra-red saunas, providing minerals/vits etc (if indicated by muscle testing), and very importantly, using sound traditional principles of nutrition. Testing which helps identify health issues includes the Meridian Energy Assessment Analysis of 12 meridians (MEAD), muscle testing (kiniesiology), and the latest laboratory testing for hormone function (the DUTCH test), food sensitivities, parasites, and mineral imbalances (including Hair Testing). Raw milk (not organic) is available from the farm via the MannaMilk Ltd Partnership – a form of herdshare. Tuition is offered in a two-day course with Pip Martin and Emily Williams, THE FARMHOUSE KITCHEN, to learn the making of traditional bone broths, lactofermented and cultured foods, and low-sugar options for preserving foods – bottling, pickles, chutneys etc. ‘Fermented’ simply means pre-digested with correct probiotic bacteria for the healthy gut and includes foods like yoghurt, clabbered milk, kefir, sourdough bread, kombucha, sauerkraut/lacto-fermented vegetables. Daily intake is critical to restoring proper gut/brain function. It is recommended to become familiar with the work of Dr Natasha Campbell-McBride, Neurosurgeon, Nutritionist and Mother of an autistic son who is today a normal teenager after following principles of tradtional nutrition ( www.gaps.me ) Her books: “Gut and Psychology Syndrome – GAPS” and “Put Your Heart in Your Mouth”, include information on the critical importance of eating good animal fats including butter, and coconut oil. Another important work is Sally Fallon’s “Nourishing Traditions – The Cookbook that Challenges Politically Correct Nutrition and the Diet Dictocrats”. Pip offers half and 1 day courses and Scenar Home use.